This guy I was travelling with in Cambodia had a portable games console. He had just about everything actually, in a backpack that weighed twice as much as he did. Unloading off a boat in Phnom Penh, the baggage guy dropped the whole thing in the Mehkong. Fortunately the console survived. We toured Angkor Wat together, and almost at the top of the central temple we got chatting to a group of monks. They wanted us to read to them from an English book of Buddhist teachings. I’d read that it was culturally insensitive to hand anything directly to a monk – you’re supposed to lay it on the floor for them to collect. However by the way they reached over and helped themselves to our cigarettes, I decided that the guidebook may have got that wrong. Then my companion pulled out his console. 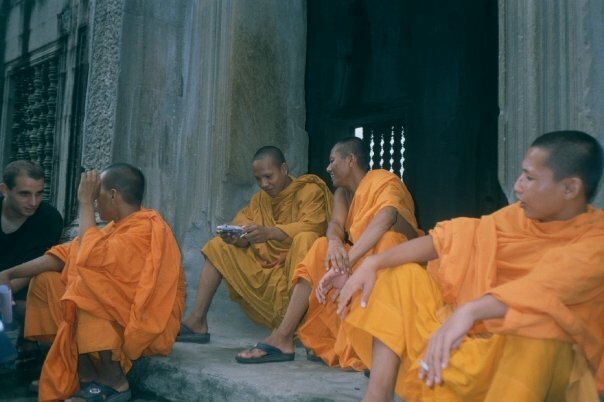 The monks lost interest in the book as he queued up a bout on Mortal Kombat and handed it over. One of the younger monks took charge, while the others gathered round to watch. Now if you don’t know Mortal Kombat, it’s an arcade style fighting game, known for its high levels of bloody violence. One particularly vicious feature is the ‘Fatality’ whereby the winning player gets to execute the loser in one of a number of sadistic methods. It takes a good knowledge of the game, and a complex combination of button presses to perform. I was never able to do it. When the monk’s game finished, I heard a strange sound. The scary computer voice announced ‘Friendship’ and I was just in time to see the monk’s character handing his opponent a present. This feature requires a one in a million combination of button presses. Or perhaps just an enlightened soul.